lilbudsjst, You still with us??? You getting anything figured out??? You better jump back in a get us headed in the right direction before someone starts talking 338!!! Back this weekend from an elk hunt with my grandson, his second in three years. We tracked a nice 6X6 for the better part of the morning and finally got sight of him. The grandson estimated the distance at slightly over 200 yards, took a good shooting position, rested, and fired. The bullet entered the right front shoulder, the bull ran 20 paces or so and dropped. Three bulls have been taken with a .243 Win, using 100gr Nosler partitions by two of my grandsons. One shot kills. OK, the .243 isn't the ideal elk cartridge, but, it has worked without wounding in the hands of a shooter that practices regularly and has the patience to wait for the right shot. 270 vs 308 may be less critical than choosing the proper bullet. As we know there are bullets with thin jackets and those with thick jackets. There are monolithic bullets (TSX, eBullet), partitions bullets, et al. To kill, a bullet must be capable of penetrating hide and bone and get to the vital organ(s). With either cartridge a properly constucted bullet that is properly placed will be affective. In guiding elk hunters for eight years and having personally killed 19 big bulls over the decades, I have seldom seen killing shots over 100 yards. That some hunters buy into the idea that they can kill a bull elk reliably at extended ranges by means of the equipment alone is appalling and, candidly, repugnant. Hunting is about making sure killing shots and those that can do that will be able to do it with any number of cartridges and appropriate bullets. 308 vs 270? You gotta be kidding. With either cartridge a properly constucted bullet that is properly placed will be affective. Hunting is about making sure, killing shots and those that can do that will be able to do it with any number of cartridges and appropriate bullets. I guess I should re-ask the question...I appreciate everyone's comments, but some seem to be going in a different direction. I will be hanloading to get the optimum performance to match the rifle and want someone that has or had both of these calibers and handloaded for them also to recommend which caliber would be best to buy in a new rifle. I have seen a .308 put a mulie down at approximately 170 yards and it seems to do the job just as well as the .270. The only really big difference I have found is bullet diameter between the two. The largest game I will use it on is Elk and those shots will be less than 100 yards, but for the mulies it could be up to 200 yards. I don't plan on having to use anything over 165 grns if it is the .308 and I used to use 130 for my .270. Thanks again for everyones help. "No Free Man Shall Ever Be Denied The Use Of Arms..."
I think you are just going to have to choose because there really is no wrong answer. I hand load both. The .308 is more efficient on powder and there are more bullets and loads for the .308 because so many shoot it and its legacy as a military/match cartridge. But you only need one good load so having more is really not an advantage. I have more than enough loads to work with on my .270 to keep me busy and challenged. Me, I have come to like my 270 more but again, part of that is due to the rifle that shoots it. I also want to shoot farther than you do and the 270 has the advantage in that domain, IMO. You can make either cartridge work for you. If I was hunting elk at the ranges you are talking about, I'd use a 140 - 150 in the .270 and a 180 in the .308 unless your using an all copper bullet like the Barnes 130 gr TSX for the .270 or the 165 gr TTSX or TSX for the .308. These are only my opinions. Yours is the one that counts. I’m unable to give any opinion of direct experience as to what you’re asking; but IMHO either caliber is more than suffice with a 200 yard max!!! Bullet selection is probably the more critical factor that should be looked upon. With that said looking at this from a terminal ballistics view point I would give the nod to the .308 due to the larger permanent cavity that will be created with the larger diameter bullet. When talking wound channels most ballistic experts agree bigger is better. Short range cartridges such as the 338 Federal, 358 Winchester and the 35 Whelen are good examples of cartridges that were designed with this premise in mind. You want quick clean kills......put the biggest diameter bullet you can through the heart or lungs of anything and their going down. The problem with the big stuff is too many guys get caught up in the velocity wars and never look at their impact velocity. Ballistic experts also agree that any projectile regardless of its mass needs to be capable of delivering it’s forces upon the intended target. Magnum velocities at short range can leave you with a less than desirable outcome, this much you’ve obviously figured out and I commend you for it. Right on! The effectiveness, given a hit, is indistinguishable between these two cartridges. That takes us to your ability and patience in making the shot count. In this area, it is your comfort with the rifle and cartridge combination that counts. I use a BLR in the .270 and a sporterized 1903 in 30-06. I really like the .270 as a cartridge but am starting to move in the direction of the '03 only because the BLR has an atrocious trigger pull. I want to thank everyone for their advice and help. I have decided to get a .308 to go with my .270 and try it out. It sounds like it will be a lot of fun to shoot and hunt with. Does anyone have some really good hunting loads I can load and start trying? I am sure there will be many to try for the best results and will take a while to find what works best with the new rifle. I think you will be happy with the .308. Loads vary from rifle to rifle but Varget is a very good powder for the .308. Let us no how ya make out. Varget is a very good powder for the .308. I agree. Varget shoots well in my .308. You may need to pick your bullet first. I choose to hunt with Barnes TSX or TTSX. Th Barnes Loading Manual #4, available on-line or in stores, has more loads but this link will give you an idea of performance. I also use the Hodgon website as a reference. When I was loading .308’s for whitetails I used 150gr Sierra Game Kings with IMR4064 and H414 that shot a MOA or better with the nod going to the 4064. That was until a friend suggested I try Winchester 748!!! I did and immediately switch to it!!! and you thought the choice of .270 vs .308 was easy!!! i use hornady 165's w Rl15 for a hunting load and 168Smk's for tgt work @ 43g's work great in lapua cases. 43g's work great in lapua cases. Cases, I forgot to mention that the brass I use has been one of the most significant factors impacting accuracy in my rifles. I'm not claiming any one manufacturer's brass is better than another but different brands shoot to different points of aim, different group sizes, and a rifle may prefer one over another. My Tikka .270 likes Remington Brass and my Rem 700 .308 likes Federal. I found this out by accident when I couldn't figure out why my groups were inconsistent. Then I realized that I had mixed Remington and Winchester Brass in the .270 and Remington and Federal in the .308. I separated them and presto, no more fliers and the groups were consistent and repeatable. Now, if I find I can't make a load work with my primary brass for that rifle, then I try a different brass. As an example, I worked for a couple of months and still was unable to get any powder weight to shoot less than an MOA for this one bullet - .270 120 gr Barnes. 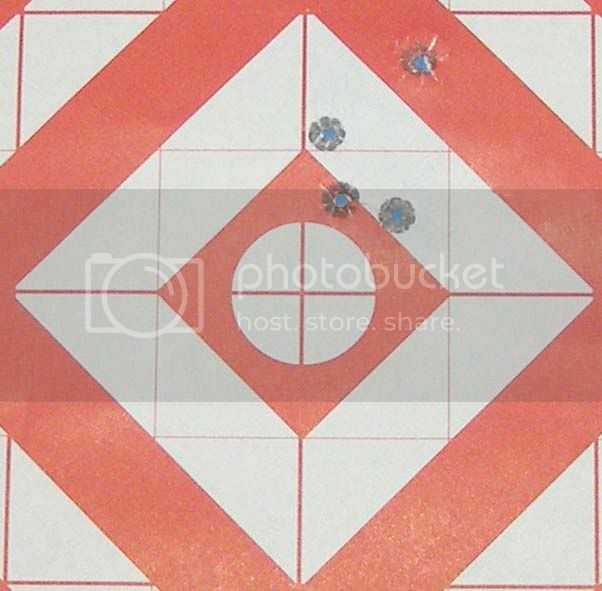 Switched the brass last weekend and had two powder weights shooting 1/2 MOA with the same bullet (see below). In the Remington brass the point of impact was 3 inches lower and 3 times as wide. Now I have 3 bullet weights shooting 1/2 MOA with the primary brass and a fourth bullet/load with the alternative brass. Cases, I forgot to mention that the brass I use has been one of the most significant factors impacting accuracy in my rifles. I'm not claiming any one manufacturer's brass is better than another but different brands shoot to different points of aim, different group sizes, and a rifle may prefer one over another. My Tikka .270 likes Remington Brass and my Rem 700 .308 likes Federal. I found this out by accident when I couldn't figure out why my groups were inconsistent. Then I realized that I had mixed Remington and Winchester Brass in the .270 and Remington and Federal in the .308. I separated them and presto, no fliers and the groups were consistent and repeatable. Now, if I find I can't make a load work with my primary brass for that rifle then I try a different brass. As an example, I worked for a couple of months and still was unable to get any powder weight to shoot less than an MOA for this one bullet. Switched the brass last weekend and had two powder weights shooting 1/2 MOA with the same bullet. Now I have 3 bullet weights shooting 1/2 MOA with the primary brass and a fourth bullet/load with the alternative brass.